Mascara, my one true makeup love. But did you know that the regulation of cosmetics and their ingredients is embarrassingly unregulated? Like, the Food and Drug Administration (FDA) hasn’t changed much since the Cosmetics Act was passed in 1938! That means that most ingredients in cosmetics have never been tested for safety, and that manufacturers are not legally required to disclose adverse effects reported by consumers. Just take a minute to look at the ingredient list of your mascara, perhaps even try googling one of the complicated-to-pronounce ones to learn about their safety. My point is, I’d rather keep questionable stuff away from my eye balls. 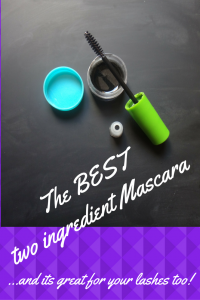 There are lots of recipes out there for homemade mascara, some requiring fancy ingredients and some not, but no matter the complexity I have found them all to be too flaky, too runny, or too oily. But this one, not only does it work perfectly, it also visibly improves the quality of my lashes; they look much fuller and shinier after only 2-3 days use! Now, this recipe, though it is super simple and has only two ingredients, is a little unconventional because it contains (drum roll, please) egg yolk! Bear with me here. Hair is mostly made of keratin, which is a protein. The protein in eggs, along with biotin (a B vitamin) fill in weakened spots along the hair shaft to temporarily strengthen hair. I say ‘temporarily’ because anything applied to hair, even those fancy shampoos, are a temporary fix. The beauty of using eggs though, is that making yourself a nice scramble with the discarded part will help your hair grow healthy and strong from the inside out. Separate a yolk from the rest of the raw egg. 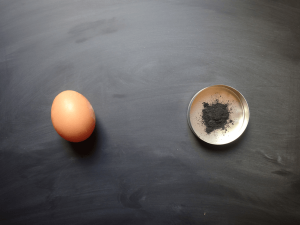 Place the yolk in a small bowl, and mix in the activated charcoal. Done. I keep my ‘mascara’ in a little container with a screw on lid in the fridge between uses. Here’s an uncomfortably zoomed-in picture to see how it looks once applied (on my right eye). I think this is what concerns people the most. I find that this mascara lasts about 4-5 days in the fridge. Remember though, that making it literally takes less time than it does to make a morning smoothie or PB & J sandwich, so its all really a matter of habit. Making a great lash lusher in 2 minutes on Mondays to last me through the work week is totally worth it in my opinion. 1. when you decide to make yourself some scrambled eggs, crack the eggs and try to break the yolk sack with a fork or other sharp object. Scoop out about 1/2 teaspoon of yolk, set it aside in your designated mascara container, mix in a pinch of charcoal, just enough to turn it pitch black, and there’s your little weekly portion. Then enjoy your scrambled eggs. 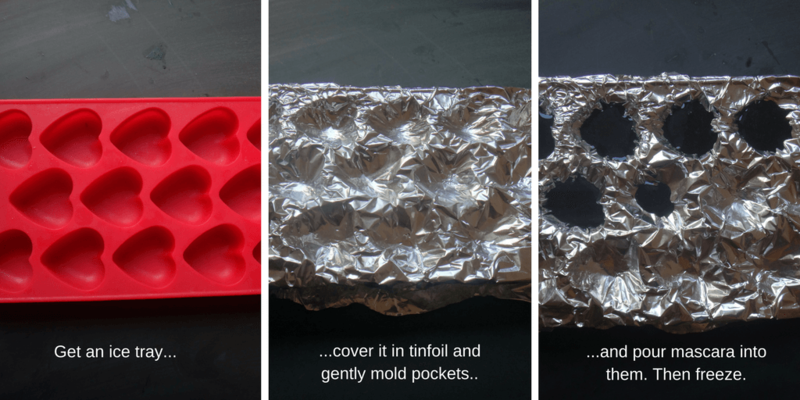 cover an ice cube tray with a layer of tin foil, making sure to create little grooves in the foil where the cube holes are, just deep enough to create a little pool for a teaspoon of liquid. 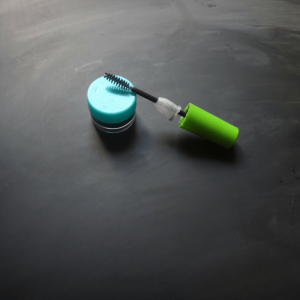 In your mascara container, pour about 1/2 teaspoon of mascara (following the recipe above) into it for this week’s use and put it in the fridge. The rest you will take and pour about 1/2 teaspoon of it in each of the grooves you created on your ice cube tray. Once you have created all these ‘portions,’ put the tray in the freezer. Once frozen you can remove the foil layer from your tray, pool all the frozen mascara drops into the middle of the foil sheet, and close them up inside as if they were in a foil sack. So, once you need a new batch of mascara for the week, just take one out of the freezer and place it in your mascara container for the week. I am the first to admit that that slender little tube sounds so convenient for adding a little glamour to your look. But give this quick recipe a try, and you’ll see you’ll love it too. **I have either thoroughly researched and/or used the above products myself, and some may be displayed as items from affiliation programs such as Amazon associates. Purchasing any product from this link does not affect your cost in any way, it just allows me to receive a small commission to help support this blog. How do you clean and store the mascara brush? I’ve been washing my hair with egg yolks for the past ten months, and it has been the best shampoo imaginable! I can’t wait to try this mascara recipe, thank you for posting it! Well… I’d like to try diy mascara but egg yolk and weekly fill up routine seems a bit of a headache for me personally. I’d rather try any liquid oil and charcoal mix. Thanks for the recipe anyway 🙂 p.s. Your eyes are gorgeous. Thanks for the comment Nina! And sorry for the embarassingly long answer time! I perfectly understand the the feeling, and it definitely isn’t for everyone. I’m curious though of an alternative you may have found since you last commented. I have tried various mixtures with oils and waxes but haven’t yet found one that doesn’t run, flake, or spoil. Any suggestions?